It's hard to feel the urgency to work on New Year's Gardening resolutions during the cold winter months. After all, it may be awhile before we can put most of them into practice. But eventually, we will be able to walk outside in our shirt sleeves and start digging in the dirt again. So why not get a little head start on learning the whys and hows of going green in the garden? Below are some suggestions for topics to dig a little deeper into for your green gardening resolutions. 1) Get to know the natives - Native plants are often an excellent choice for your landscape. Plants that are native to an area are adapted to deal with the local conditions. However, it is still important to keep in mind the principles of "right plant, right place." In other words, if you have a wet site, choose plants that like a little extra water. If your landscape is dry, choose plants accordingly. This post lists resources to provide information on local native plants. 2) Conserve Water - It is estimated that more than half of residential water use occurs outdoors. By making changes to some of our landscaping practices, we can all make a difference in water conservation. Group plants by their water requirements. Use drought tolerant plants . Cut down on the amount of lawn in the landscape since turfgrass is a water hog. Use rain barrels. 3) Cut out the chemicals - Chemicals used in a landscape are harmful to children, pets and local waterways. Learn to deal with weeds and pests in a more environmentally friendly way. Hand pull weeds, attract beneficial insects and create your own compost as a natural soil amendment. 4) Protect the groundwater - Everything that goes into the ground around your home has the potential of finding its way into local water supplies. Not just the chemicals listed above, but also pet waste and the chemicals we use to wash our cars. We can learn to eliminate chemicals, clean up after our pets, and direct downspouts into garden areas which can absorb the runoff. 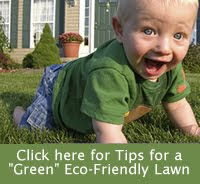 And never leave clippings or fertilizer on sidewalks, driveways or roads. 5) Garden for wildlife - Providing the four basic needs for wildlife - food, water, shelter and places to raise young - is a wonderful way to turn your landscape into a protective spot for local birds, bees and butterflies. GREAT tips! Gonna retweet that! I highly recommend DRIP irrigation for water conservation. I use less than half the water I used to, it cuts down on plant disease (many plants especially veggies don't enjoy being sprinkled) and it was far easier to set up than I had thought.